Mike Leigh's latest film steps back in time to examine what led up to a historic event. To the people on screen, it's just life as they know it. Now in his mid-70s, Leigh has been following his own distinctive creative instincts for more than 50 years. He first received training as an actor and then as a director for the theatrical stage in the 1960s, eventually coming up with his own formula for dramatic fiction: bring together a collection of characters, all developed by individual actors, and then structure a story, inspired by their improvisations. Through this method, Leigh and company made a series of plays for television. Leigh then began to focus on the big screen. Of his 12 previous feature films, I've seen eight of them: High Hopes (1988), Life Is Sweet (1990), Naked (1993), Secrets & Lies (1996), Topsy-Turvy (1999), Happy-Go-Lucky (2008), Another Year (2010), and Mr. Turner (2014). His films are marked by fine performances, a variety of characters, and a clear-eyed view of the consequences of decisions made by those people. 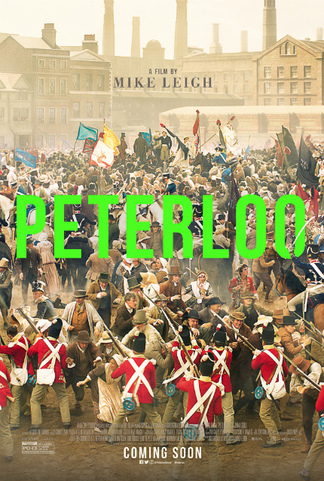 In Peterloo, Leigh and company venture back two centuries, to the time after the Battle of Waterloo, which saw the defeat of Napoleon and the subsequent return of British troops to their homeland. We see a celebrated military commander receive a new assignment in the north of England, which serves as an introduction to the upper class of the country. We also see a young soldier named Joseph, who must walk all the way home to Manchester, where he collapses after being welcomed home by his family. The story is centered around what takes place in Manchester, an industrial city filled with hardworking people who labor at their trades and in a cotton mill. The women work all day, either at the mill and/or at and around their humble little homes. Their lives are defined by their work, which also hems them into a lifestyle that leaves little time for anything other than working and spending a little time with their families. Out of this mass of lower-class people, strong calls for reform issue forth, especially those regarding civil and political rights. At the same time, the local magistrates lord their self-righteous superiority over the people, handing out stiff judicial punishment for even the most minor of crimes; the magistrates feel it is their duty to keep the lowly people in their place. Down in London, rising protestor Henry Hunt (Rory Kinnear) raises hackles through his electrifying radical speeches, and Home Secretary Lord Sidmouth (Karl Johnson) huffs and puffs and wants to blow all dissenters away. Gradually, pressures rise among the people, among the magistrates, and among the ostensible leaders in London. What brings everything to a boil is an event in Manchester where Henry Hunt will speak out about the issues of the day. Neither the magistrates nor the ruling class in London want to hear anymore about it and are resolved to call forth the military to shut it down. 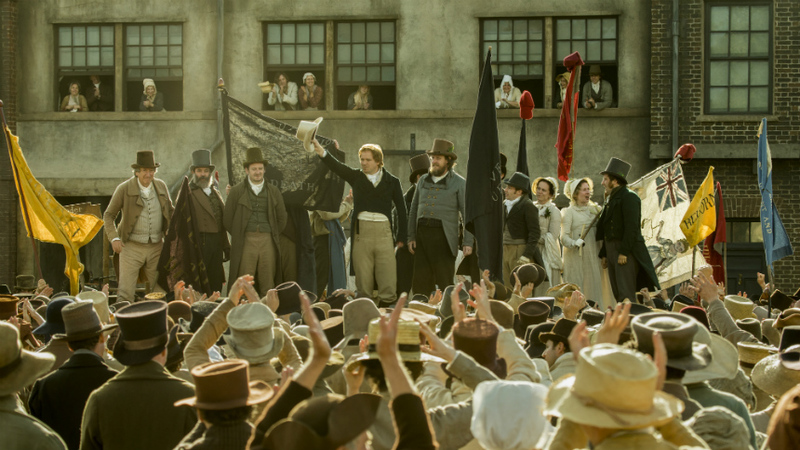 Even though I often felt like someone who's been tossed into the deep end of a swimming pool without knowing how to swim, I found Peterloo to be fascinating, in large part because it was telling stories I'd never heard before. As events begin to swirl out of control, reflecting the increasingly charged atmosphere and the surging emotions of the people, the magistrates, and the rulers, a fatalistic tone enters the picture, but not to a melodramatic degree. Peterloo proves to be a historical drama unlike other historical dramas, in large measure because of the methods that Mike Leigh employs. It's an absorbing experience, to see history come to life in such vivid fashion, starring the living, breathing people who fought for their rights, whether it was their intention to do so, or not. The film opens in select theaters in New York and Los Angeles on Friday, April 5, via Amazon Studios. It will thereafter expand to other cities in the coming weeks, including my city of Dallas on Friday, April 19, 2019.